Condition is New. Retro look. Taped neck and shouldersPre-shrunk Jersey knitQuarter-turned to eliminate crease. Screen print opaque white. Condition is New. 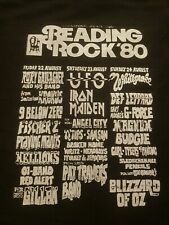 Reading Rock Festival 1982 T Shirt. Retro look. Taped neck and shouldersPre-shrunk Jersey knitQuarter-turned to eliminate crease. Screen print opaque white. I made these for my friends and they just loved the idea and originality. If no one wants it, it will go in the bin, but was well loved. Holes in it, has white paint on it, and well worn ! THIS ONE SHOULD PROBABLY GO IN THE BIN ! READING AND LEEDS FESTIVAL. PIT TO PIT APPROX 22". SHORT SLEEVED T-SHIRT. READING FESTIVAL "THE ULTIMATE FESTIVAL BAND" - LADIES T-SHIRT. FRONT - TEXT READ "THE ULTIMATE FESTIVAL BAND", "READING" BELOW ARE IMAGES OF A BAND BELOW EACH IS WRITTEN "ON GUITAR", "ON DRUMS", "ON VOCALS" & "ON BASS". Public Enemy Tour T-Shirt Reading Festival 1991. Condition is Used but VVG ! 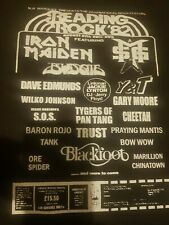 Official Merchandise - Bought at Reading Festival in 1991. Very reluctant to sell - It was the first time I saw them and the gig was huge. Reading Festival hadn’t seen anything like it before. They size is a true large (always been a bit big for me) Free shipping in the UK - outside the UK will have to pay. Give me a shout if you have any queries. Cypress Hill, Primal Scream & Red Hot Chili Peppers. Back collar to hem 29.5". Slight fading of material. Print still strong.